We always get stoked when we run across another Mississippi Records release for Abner Jay. 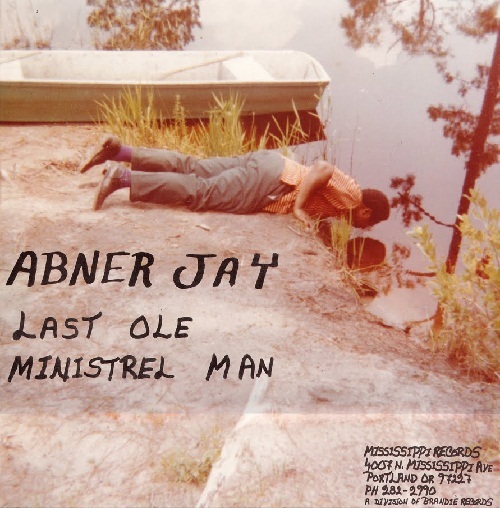 They’ve done a few over the last while: True Story of Abner Jay LP, Depression single, and now a new 10″ called Last Ole Minstrel Man. 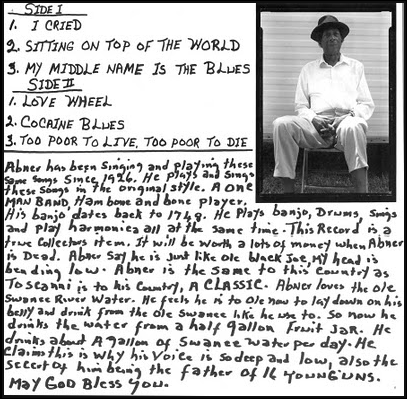 This one features the last recording session that Abner did in Georgia in 1994 with Jack Teague [the record also comes packaged with photos and some endearing liner notes written by Teague about his time getting to know Abner] The cover of the record shows Abner drinking straight from his Swaunee River. We can only hope that this isn’t the last release we’ll see from Mississippi having to do with our favorite one-man-band. And if it is, we’d hope that someone would let us know soon so we can go ahead and pick up another copy before we run through this one. Do yourself a favor and make sure you snag this one before they’re all gone. My natural-born name is Trouble, my middle name is The Blues. Folk song tells true stories, but turrible stories. Because folk are turrible.